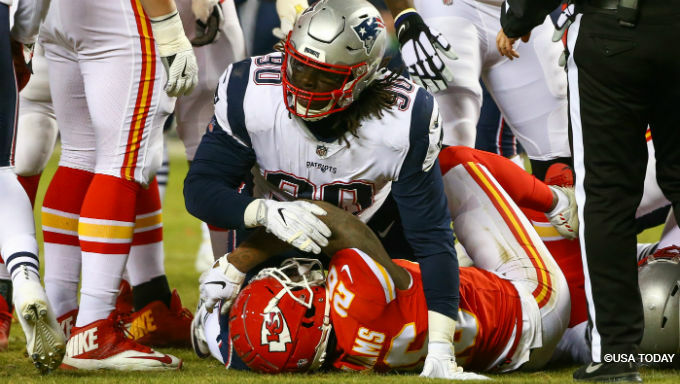 When the Patriots overcame a vicious Chiefs rally to win the AFC Championship game, they built their initial cushion by playing an extraordinarily aggressive defense. Cover-1 (one deep safety) and pure-man looks were all over the place, with an emphasis on not letting Patrick Mahomes get out of the pocket and keeping Tyreek Hill from seeing single coverage. But an overlooked fact of that aggressive defense is that the Patriots held the Chiefs to just 41 rushing yards, with only seven of 14 rushing plays being successful by Success Rate. You may be aware that passing is generally more successful than rushing -- that’s a fact of the way the NFL has changed the sport over the last decade -- but for the Patriots in particular, we’re on Year 2 of a rushing defense that has been shredded in spots. They finished 19th in rush defense DVOA this year per Football Outsiders, and 31st in the same category in 2017. An offseason trade for Danny Shelton at nose tackle has paid some dividends, but Shelton missed a lot of the season and was inactive for the AFC Championship game. It’s the Super Bowl, a game where one mismatch can invalidate an entire season of work. Let’s take a deep dive so that fans of NFL betting can be better informed while betting the Super Bowl. The Rams had one of the best rushing offenses in the NFL throughout the regular season, and when their run game was stifled, the carefree Sean McVay points-creation system became more of a slog. The Rams went 7-0 in their seven best rushing DVOA single-game performances of the season. In their three losses, they were held under 100 yards rushing all three times. Are the Patriots going to be able to stop the run? Is Shelton fast enough to stay on the field against three-wide sets? The Rams averaged 5.2 yards per carry running out of their default three-wide set, per Sports Info Solutions. That’s a statistic that is essentially unchanged even when factoring Cooper Kupp out of the lineup, and even when noting that Todd Gurley looked ineffective down the stretch. They averaged 5.25 yards per carry out of those sets in Weeks 11-17. Meanwhile, the Patriots allowed 5.17 yards per carry on the season to runs against three-wide sets. It is worth noting that they were slightly better against zone plays, allowing about 4.3 yards per carry there -- SIS counts 260 of the Rams rushing plays as zone plays -- that is the main offensive design of McVay’s rushing offense. So, there are subjective reasons to believe the Rams have an advantage against a bad run defense, and there are subjective reasons to believe a better track record against zone can tilt things towards the Patriots. Let’s theorize what happens in each scenario. What happens if New England can stifle the Rams at the line of scrimmage without committing extra defenders? If the Patriots are able to hold the running game down, they come away with some very important advantages in this game. Los Angeles’ receiving corps is not quite as scary as it was with Cooper Kupp, even if Josh Reynolds has proved to be an adequate in-season replacement. The Patriots love to put one deep man and their less impressive corners on one receiver -- usually the deep threat -- and use lockdown corner Stephon Gilmore on the other. Assuming that plays out as expected, it puts the Rams in a position where Brandin Cooks isn’t altering the game deep, and it probably puts Robert Woods in Gilmore’s grasp. The Rams would then have to go win the game with Reynolds and the tight ends, Tyler Higbee and Gerald Everett. Higbee and Everett have one 60-yard game on the season, combined. This isn’t something that the Rams have been designed to do. If the Patriots force the Rams into two tight end sets to try to establish the run? The Patriots have performed better against 1-2-2, allowing 4.6 yards per carry, and that set puts Shelton’s ability to clog gaps into a bigger role. I do believe we will see a lot of Shelton in this game because of Malcom Brown’s spot on the injury report. 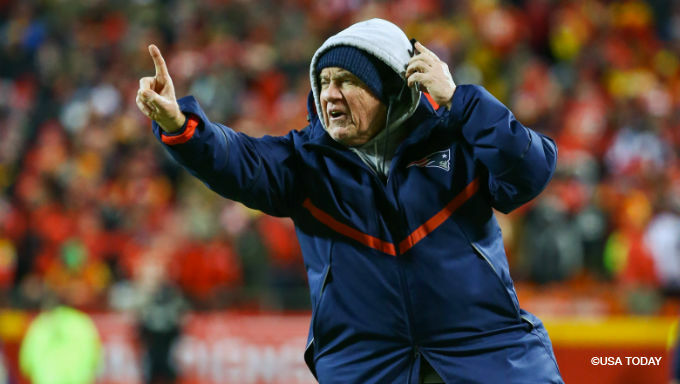 The open question facing Bill Belichick in this game is how much he wants to take from the two games where Los Angeles’ offense was truly shut down this year: Weeks 14 and 15 against the Bears and the Eagles. Both defenses were able to stifle the normally robust Rams play-action game to merely 5.9 yards per attempt. Defending Jared Goff is a little different than defending Mahomes because Goff doesn’t have the same ability to make plays outside the structure of the play. They’re dropping a bunch of zone coverage, and they’re giving Goff a tight window along the sideline to Josh Reynolds. Except that Avonte Maddox is actually reading Goff’s eyes, and Goff hesitates on the throw just a little bit. This was nearly picked off because the throw wasn’t out on time. If the Patriots are able to use that kind of game plan against the Rams, and cut off the deep play-action pass, the Rams aren’t going to be able to score enough to hang in this game. The cascade effects of not being able to run the ball for the Rams are catastrophic. This isn’t the Kurt Warner Greatest Show on Turf team that gets the ball downfield on one long strike purely out of the design of the play. What happens if the Rams are able to run roughshod over the Patriots? The first thing that a great running attack will allow the Rams to do is shorten the game. Tom Brady has emerged from a midseason slump, but is still prone to the odd bad series here or there. The Super Bowl bye week likely helps a lot as far as arm strength concerns. Overall, the fewer chances Brady gets, the better as far as the Rams are concerned. Once Los Angeles is able to get New England committing more defenders to stopping the run, the threat of the play-action game looms. Statistical studies will tell you that the success of the running game has no impact on the success of play-action. But that doesn’t get into the in-game adjustments of more players in the box and how that changes play-action success -- that’s where I think the Rams will get more of a free run if they are able to get success in the running game. I’m thinking about posts against Cover-3 or Cover-1 mainly. The Rams have more success off play-action in the middle of the field than they do in the interior. Their big drive to initially tie the game against the Saints last week started with a deep play-action post to Reynolds, when New Orleans swarmed the middle of the field so much that they couldn’t throw the post. Here, you can see that Reynolds won on the out and up to the outside because the Saints stacked that middle of the field. It’s a good example of how McVay was making in-game adjustments against their tendencies. The Los Angeles passing offense is at least somewhat reliant on dictating these sorts of matchups to the defense via formation and play design. They haven’t done well this year when they’ve been taken out of their comfort zone. The Bears, for instance, had entire swaths of the game where they ruined weak-side running plays by having Khalil Mack lined up over left tackle. Because Mack is able to get upfield against Whitworth before a guard can help out, the Bears were getting one-on-one looks on the cutback lanes and they filled them up. Belichick has made a Hall of Fame career off getting offenses off-balance. He’s been doing it since he knocked off the George Seifert version of the vaunted West Coast 14-2 49ers in 1990, as Giants defensive coordinator. With two weeks to prepare for this game, he’ll have a variety of plans and backup plans. This Rams offense has a lot of star power and not many weak links, outside of John Sullivan at center in pass protection. There’s also Gurley’s health, which is an open concern after he received just four carries against the Saints in the NFC Championship game. The Rams can make hay with C.J. Anderson, a fine back who can sustain things between the tackles. I don’t have a conclusion I’m anchored to in this game, but there’s something about the Belichick side of this equation that would leave me feeling a little bit safer than I would betting on the Rams. There’s a longer track record of success. McVay has made some great in-game adjustments, but I think if he’s making them here, the Rams are already in a danger zone of sorts.